I thought meditation was some taboo, eastern new age philosophy thing, perhaps tied into Buddhism. However, God tells Joshua to meditate on Moses’ “Book of Instruction” (which is Deuteronomy I believe, or maybe all the previous books). So, as long as you are keenly focusing in on the Word of God, then meditation is cool. When Joshua saw the “Commander of the Lord’s Army” and asked whether he was “friend or foe,” the commander answered, “Neither one.” Why would an angel say he wasn’t a friend of Joshua, leader of the chosen Israelites? The Lord told Joshua that Jericho had already been defeated before the Israelites had even begun their attack. God had already delivered them a victory over their enemy. Much like today, where the grace of Christ’s death on the cross has delivered us from sickness and all other evils. Now, and in our future, God is saying that we have been delivered from these things, we only need to act on the belief that they are, in fact, already defeated. Christians praying for healings of cancer and illness have already defeated it, they just need to get up and walk the walk. A non-believer has not yet tapped into this ability because they do not believe. They have not accepted Jesus as their Savior and been born again. Should the inflicted person be a Christian as well as the one praying, how much faster would the healing come? I liken it to someone driving around in an Ozarka delivery truck and complaining that they’re thirsty. The water’s already there. All you have to do is pop the top. After leveling Jericho, Joshua invoked a curse that anyone who would ever try to rebuild the walled city would lose their firstborn and youngest son (Joshua 6: 26). Later in 1 Kings 16:34, this curse was fulfilled when a man named Hiel rebuilt the city and lost his oldest and youngest son as a result. The city of Ai was wiped out by Joshua and the Israelite army – 12,000 men, women (and presumably) children were killed or offered as sacrifices/slaves. The king of Ai was impaled for a day on a pole, then buried under a mound of rocks at the gate of the ruined city. Another “lost book” called the Book of Jashar/Book of the Upright records the battle where Joshua prayed “Let the sun stand still over Gibeon, and the moon over the valley of Aijalon” where the sun literally hung in the sky, not setting like a normal day, until all the enemies who attacked Gibeon (an ally of the Israelites) were either killed by sword of the Lord’s miracle hail storm. (Joshua 10:7-14) The Hebrew language – the original language of the Bible – seems to indicate that the earth’s rotation was slowed down for a bit to allow for the 5 armies of the 5 enemy kings to be defeated. The 5 kings were impaled on poles and then their bodies were tossed into the cave where they previously hid from the Israelites during the battle. Large stones were placed in front of the cave and the bodies of the 5 kings were left to rot. Joshua and the Israelites wiped out people, cities and armies like it was nobody’s business. All in the name of God. However, God was wanting to set His people apart as Holy, something that couldn’t be done in a land of idol worshipers and blatant sinners. And sin wasn’t relative to the Israelites. Sin was just the name put on the horrible practices people naturally tend to lean towards. So, the Canaanites and the rest were sinners, they just didn’t care. Their belief in false gods of wood and ivory encouraged them to sin – which is why God couldn’t let the Israelites be tempted by them. And why these pagans had to be dealt with permanently. The conquest of Joseph and the Israelites over the majority of Canaan took 7 years. When all the land was being allotted, the tribe of Judah was given many areas, including Jerusalem to take over, but they could not drive out the Jebusites who lived there, so they were forced to dwell among them. The tribe of Manasseh was given Megiddo as one of their allotments, which, according to Revelation, is the battleground for the Armageddon. The tribe of Benjamin was given the town of Jericho as one of their allotments, but that town was never to be rebuilt again and cursed was the man who attempted to do so. The tribe of Zebulun was given Bethlehem as one of their towns. Joshua died at the age of 110. He was buried in his allotted hometown of Timnath-serah. The bones of Joseph which had been carried since the Exodus, where buried at Schehem, in the field that his father Jacob had bought long ago. 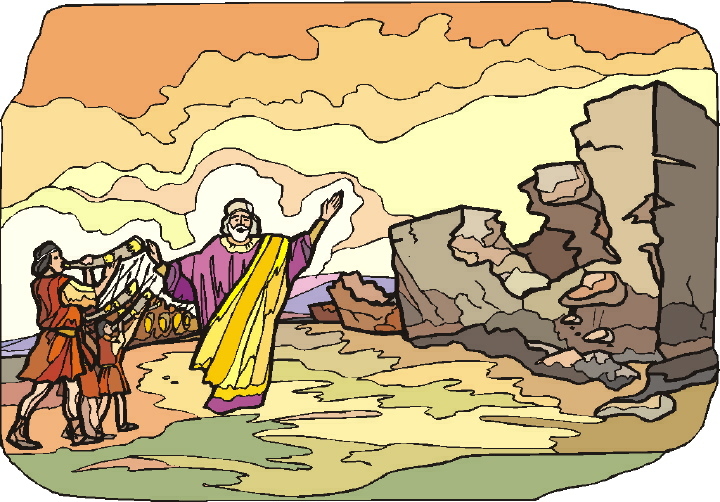 Soon after, the High Priest, Eleazar, son of Aaron, died. He was buried in the town of Gibeah, which was given to his son, Phinehas. Joshua’s greatest line and lasting legacy was, “Rather, cling tightly to the Lord your God as you have done until now.” (See Joshua 23:8) He told them to remain focused on God and hold fast to the ways He tells us to live and be.